The Standards and Guidelines for Quality Assurance in the European Higher Education Area (ESG) were adopted by the Ministers responsible for higher education in 2005 following a proposal prepared by the European Association for Quality Assurance in Higher Education (ENQA) in cooperation with the European Students’ Union (ESU),1 the European Association of Institutions in Higher Education (EURASHE) and the European University Association (EUA). Given this changing context, in 2012 the Ministerial Communiqué invited the E4 Group (ENQA, ESU, EUA, EURASHE) in cooperation with Education International (EI), BUSINESSEUROPE and the European Quality Assurance Register for Higher Education (EQAR) to prepare an initial proposal for a revised ESG “to improve their clarity, applicability and usefulness, including their scope”. The revision included several consultation rounds involving both the key stakeholder organisations and ministries. The many comments, proposals and recommendations received were carefully analysed and taken very seriously by the Steering Group (SG). 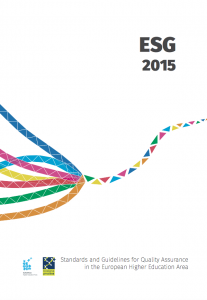 They are reflected in this 2015 version of the ESG. The ESG 2015 were adopted by the Ministers responsible for higher education in the European Higher Education Area in May 2015. As a result of the participative revision we are confident that they reflect a consensus among all the organisations and ministries involved on how to take forward quality assurance in the European Higher Education Area and, as such, provide a firm basis for successful implementation.